Making the move from Outlook (or another mail client) to Gmail can be jarring. It means giving up the folder system you've used for years, getting accustomed to an entirely new interface, and so on. One aspect of Gmail I've always disliked is that you have a click a message to read it; there's no preview pane like with every other mail system on the planet. Actually, there is, but it's not an official feature. Rather, it's a Google Labs experiment, and has been for about a year. The aptly named Preview Pane makes Gmail decidedly more Outlook-like, giving you a three-column view with an instant preview of any email you click. PC World's Robert Strohmeyer wrote about Preview Pane when it first debuted, so I'll defer you to his overview for more details. But I will say this is my single favorite Gmail tweak ever. To me it makes the service a lot easier to live with. As someone who's lived in Outlook for about a decade, it's awfully difficult for me to give up the folder system I know and love for Gmail's total lack of message organization. But once you give yourself over to the concept of labels and filters (and learn to use Search instead of rummaging through folders), it's not so bad. Google offers brief but informative tutorials on using filters and using labels. I also recommend reading the How-To Geek's "How to Use Gmail's Advanced Search Features & Create Filters," which does some deeper diving into these two important areas. 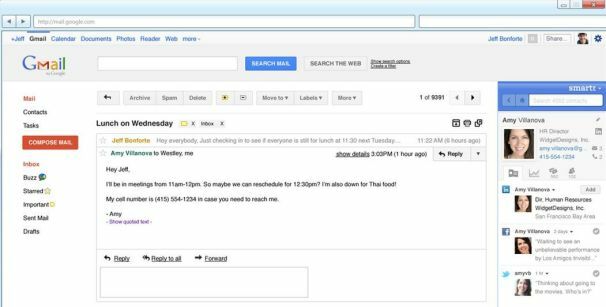 Xobni's SmartrInbox for Gmail emulates Outlook's social-network connectors, adding a Gmail sidebar that displays Facebook, LinkedIn, and Twitter profiles for your contacts. That's handy enough, but SmartrInbox goes way further by showing you things like your relationship history, recent communication, and common contacts. Once you start perusing these useful nuggets of information, you'll find them downright indispensable. One thing to note: SmartrInbox works with Chrome, Firefox, and Safari, but not Internet Explorer. Seriously, though, this thing is so useful, it's worth switching browsers. While we're on the subject of Gmail add-ons, I cannot speak highly enough of Boomerang for Gmail. It doesn't necessarily ease the transition from Outlook, but it does make Gmail infinitely more awesome. What tips would you offer to someone who's making the move to Gmail?